Today we have released Elcomsoft iPhone Password Breaker 1.20 which introduces two new features and fixes few minor issues. This feature allows to view contents of keychain included with encrypted device backup. Mac users are probably familiar with concept of keychain — it is a centralized, system-wide storage where application can store information they consider sensitive. Typically, such information includes passwords, encryption keys and certificates, but in principle it can be anything. Data in keychain is cryptographically protected by OS and user password is required to access it. The closest Windows equivalent for keychain is probably Data Protection API. iOS-based devices also have a keychain, but instead of user password, embedded cryptographic key is used to protect its contents. This key is unique to each device and so far there are no way to reliably extract it from the device. Prior to iOS 4 keychain was also included in the backup ‘”as is”, i.e. all data inside was encrypted using unique device key. This meant that it was not possible to restore keychain onto another device — it will try to decrypt data with key which is different from one used to encrypt data. Naturally, this will fail and all data in keychain will be lost. To address this issue, Apple changed the way keychain backup works in iOS 4. Now, if you’re creating encrypted backup (i.e. you’ve set up a password to protect backup) then keychain data will be re-encrypted using encryption key derived from backup password and thus ca be restored on another device (provided backup password, of course). If you haven’t set backup password, then everything works like before iOS 4 — keychain encrypted on device key is included in the backup. There are passwords for all Wi-Fi hotspots I have ever joined (and haven’t pushed “Forget this Network” button), for my email, Twitter, and WordPress accounts, as well as Safari saved passwords and even my Lufthansa frequent flyer number and password! 🙂 And I don’t use Facebook/LinkedIn/anything else on my phone — otherwise I guess credentials for those will be also included in the keychain. 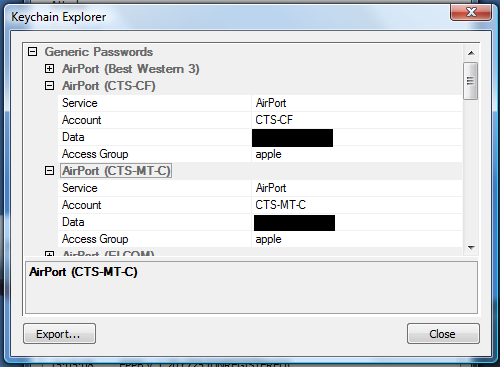 Keychain Explorer will work only against backup which is encrypted. If you happen to have an iOS 4 device and want to get password from it — set a backup password in iTunes, backup device, use Keychain Explorer to view and/or export keychain passwords, and, finally, remove backup password in iTunes. This feature is far less exciting than Keychain Explorer, but we believe it should improve user experience with Elcomsoft iPhone Password Breaker. The idea is simple: all passwords which are found by EPPB or which are used to open backup in Keychain Explorer are stored in password cache. When you later try to open backup in Keychain Explorer or recover a backup password, program first checks password cache for correct password. Passwords in cache are stored using secure encryption. Also, there is a new EPPB FAQ online. Worth reading if you’re thinking of purchasing EPPB or want to learn more about it. There is at least one really big update for EPPB coming in September or October, so stay tuned! It’s been two weeks since Steve Jobs has announced release of new iPhone 4 and iOS 4 operating system during his keynote on WWDC’2010. New iPhone will begin shipping on Thursday, 24th of June, and new iOS will become available for download today, just few hours are left. iOS 4 comes packed with a lot of nice features (long-awaited multitasking, background location services, iBooks and much improved Mail app just to name a few) and we are very pleased to announce today the release of the new version of Elcomsoft iPhone Password Breaker with support for iTunes 9.2 and iOS 4. 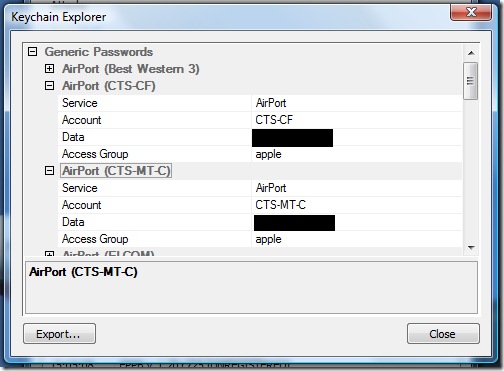 Elcomsoft iPhone Password Breaker (or EPPB for short) is a utility to recover passwords for encrypted and password-protected iPhone/iPod/iPad backups created with iTunes (please note that it’s not meant to recover or remove passcode lock on the device). With iOS 4 Apple has completely changed the way backups are encrypted and stored. Backup and restore processes are way much faster now. Apple have also improved protection against password recovery attacks, thus making our job harder (password recovery is about 5x slower for new backups than for older ones). We at Elcomsoft try our best to keep up with the times, so most of our tools & programs are adjusted to the latest technologically advanced features. The EPPB is not an exception, new version of EPPB fully supports both old and new backup formats. It also supports hardware acceleration using NVIDIA and ATI GPUs and Tableau TACC1441.